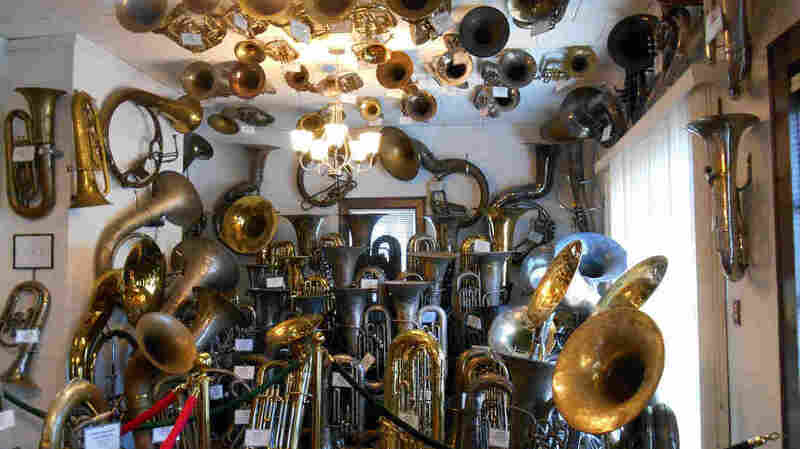 A Museum With Nearly 300 Brass Horns: You've Gotta See It Tuba-lieve It Vincent Simonetti started playing tuba in high school in the 1950s. It was love at first puff. Now he and his wife, Ethel, have filled a house in Durham, N.C., with tubas for the public to tour. Single-belled baritones and euphoniums line the ceiling of the V&E Simonetti Historic Tuba Collection to make room for the bigger instruments on the floor and walls. "And I would draw it in study hall. I'd draw pictures of it. I don't know why. I just became obsessed with it," he says. He and his wife, Ethel, used to run a tuba exchange that sold sousaphones, euphoniums and other members of the tuba family to high school bands. Now that they're retired, they've converted a house into a home to almost 300 tubas. The collection fills five rooms. He says the tuba we know and love was invented in Germany in 1835. "I have one almost exactly identical to that first tuba from 1845," he says. Morning Edition is visiting unsung museums all across the county, those little-known but ridiculously interesting gems you're glad you stumbled across.